Happy Thursday, y’all! It’s the final week of pie month (man, with five Thursdays in March, it feels like pie month has gone on forever!) 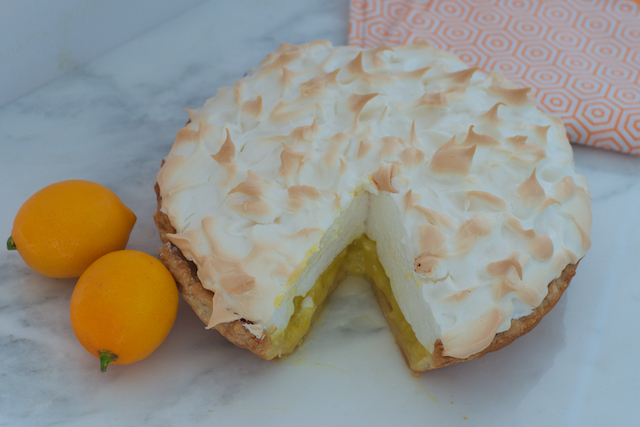 and I figured I’d finish it off with a Meyer lemon meringue pie, my namesake pie. Haha, kidding. This pie was an interesting one. 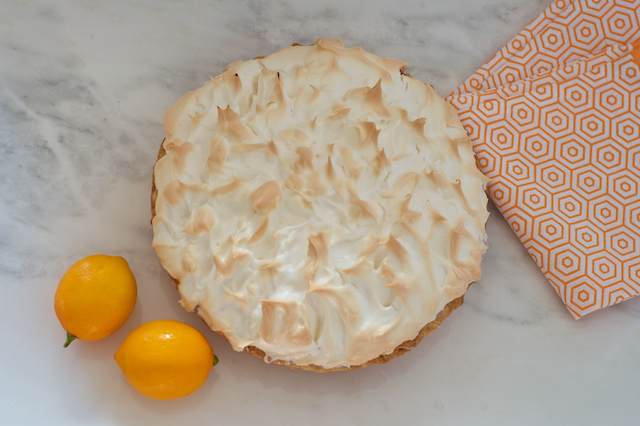 It’s the first time I’ve made a Meyer lemon meringue pie. I usually opt for lemon tarts, but I wanted to try the pie. I made it twice, and the first time it tasted nice, but something wasn’t quite right (I was mixing around quantities for the recipe on my own). Then I got nervous. Feels a bit silly saying I was nervous of a pie, but the farmers market Meyer lemons weren’t cheap, so I also didn’t want to waste any more of the really lovely ingredients. The other week I was in the Manhattan Beach library (I love the library and this is a really good one!) and I decided to browse the cookbook aisle to see what I could find out about this lemon meringue pie situation. I came across America’s Test Kitchen cookbook by Cooks Illustrated from 2002, which had three pages dedicated to the lemon meringue pie. I had previously looked at a few church cookbook lemon meringue pie recipes, but those cookbooks can sometimes be quite scant on the specifics. Ha! 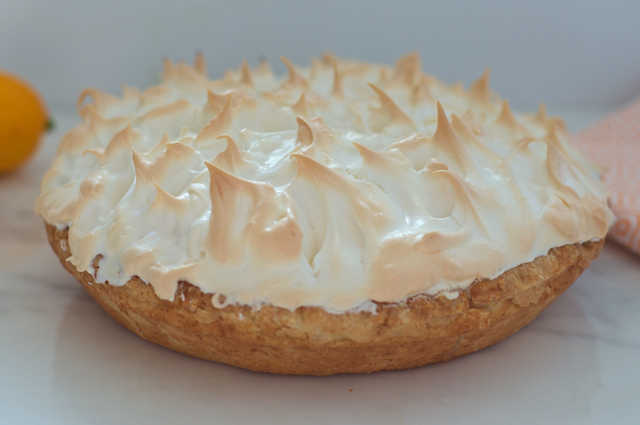 There will be more lemon meringue pie days in the future, but for the time being, I might revert to lemon meringue tarts. 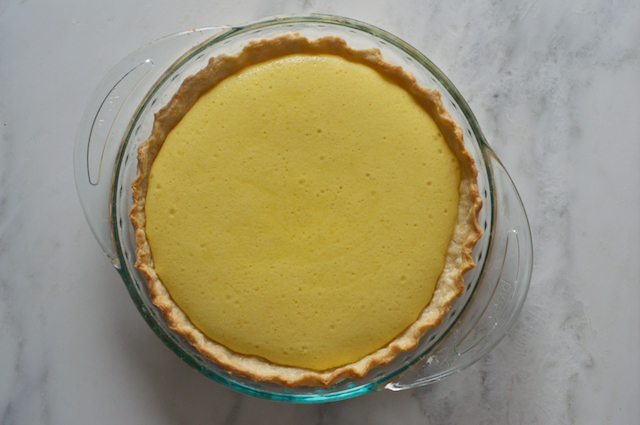 I love meringue, but not really that much meringue and I like the thicker curd of a lemon tart a bit better. What do y’all think? If you’re brand new, we have a new recipe that comes out every Thursday. January covered all things Southern cakes: week one/caramel cake, week two/Hummingbird Cake, week three/sour cream pound cake and week four / pineapple upside down cake. February was all about cookies!! Week five / best chocolate chip cookies, week six / Italian macarons and week seven / chocolate covered alfajores and the final week of the month, week eight / DYI Samoas Girl Scout cookie. March is everything pi(e)! Week nine kicked off with a chocolate chip cookie with dulce de leche, week ten was my birthday mint chocolate chip grasshopper pie, a bonus Pi Day pizza pie recipe by a guest contributor, week eleven with a savory St. Patrick’s Day Guinness Cottage Pie, and week twelve / cherry hand pies. 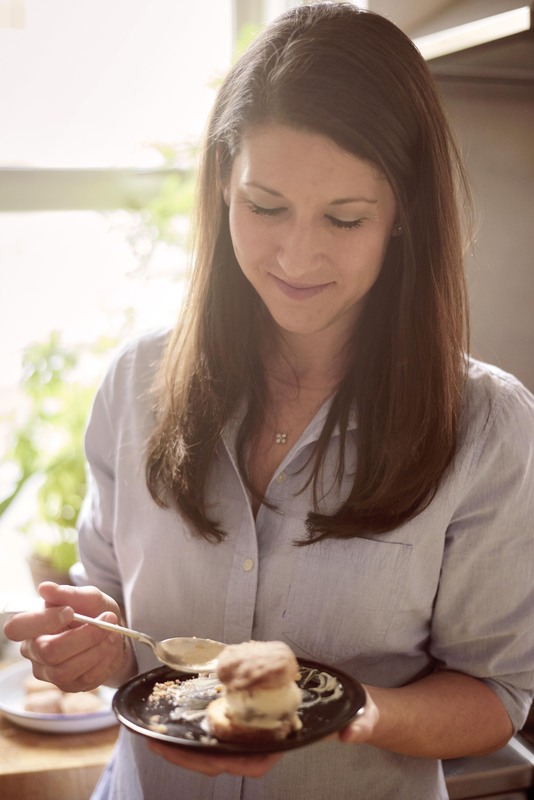 If you’re a regular, thanks again for coming back for another #BakingWithBeth recipe! Be sure to follow along Instagram and Facebook and tag #BakingWithBeth so I can see what kind of recipe for adventures y’all have going on. In a food processor, pulse together flour, salt and sugar to combine. Add chilled shortening and pulse to combine to get a sand-like mixture. Cut chilled butter into small pieces. Add to food processor and pulse in small intervals until mixture resembles peas. Transfer mixture to a medium bowl. Using a spatula, add 4-5 TBSP of water and incorporate to form a slightly tacky dough. Flatten dough into a disk and wrap with plastic wrap. Chill for at least an hour. After an hour, take dough out of the refrigerator. Sprinkle the counter with 2 TBSP of graham cracker crumbs. Roll out dough to a 12-inch disk. Sprinkle as you go with additional crumbs. Transfer the dough to the pie dish by rolling it gently over the rolling pin. Gently work the dough into the corners. Trim off excess dough and fold remaining underneath itself. Crimp or flute the edges of the pie as you wish. Refrigerate pie dough for 40 minutes and freeze dough for 20 minutes. Once very cold, remove pie from freezer and double fold aluminum foil inside the shell with 2 cups of pie weights or baking beans. Bake in a 375 degree Fahrenheit preheated oven on a lower-middle rack for 25-30 minutes. Remove from oven and carefully remove the foil and beans. Return to oven and bake for an additional 10-12 minutes or until golden brown. Let cool. In a medium saucepan, bring 180 grams of sugar, salt, water and lemon juice to a simmer over medium heat, stirring occasionally to dissolve the sugar. In a separate bowl, whisk the egg yolks with the remaining sugar (60g), cornstarch and lemon zest. Whisk mixture until pale yellow. Once the liquid has simmered, slowly pour in a little at a time and whisk with the yolks to temper the eggs. Continue adding a little a time until all is added. Pour mixture back into the saucepan and cook over a medium heat. Stir constantly with a spatula until mixture boils and is thick. This takes a few minutes and the mixture temperature should be around 175 degrees Fahrenheit. Remove from heat and place plastic wrap directly over the top of the curd to keep hot. In a small saucepan, mix cornstarch with water and bring to a simmer while whisking. Once mixture thickens and turns translucent, remove from heat. Let cool and beat egg whites. Beat whites and vanilla in a stand mixer until frothy. In a small bowl, mix the sugar and cornstarch. Once whites have developed soft peaks, begin adding in sugar/cornstarch mixture slowly one tablespoon at a time until all is added. Beat to stiff peaks. During the last few minutes of mixing the meringue, heat curd on low to make sure mixture is hot. Pour hot filing into the pie shell. 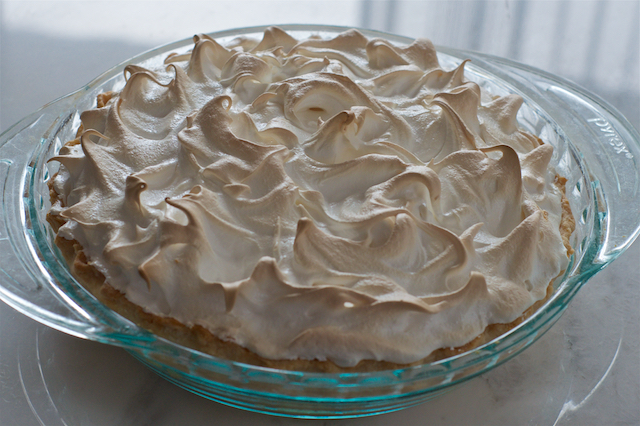 Using a spatula, distribute meringue evenly around the edge and then center of the pie. Make sure meringue attaches to the crust. Use a spoon or fork to create peaks. Bake in a preheated 325 degree Fahrenheit oven until meringue is golden brown. About 20 minutes. This recipe is take from the Here in America's Test Kitchen: All New Recipes, Equipment Ratings, Food Tastings, and Science Experiments from the Hit Public Television Show (2002) and regular lemons were substituted with Meyer lemons. I converted everything to grams from the cookbook. I don't think my filling was piping hot enough when I put the meringue on top.